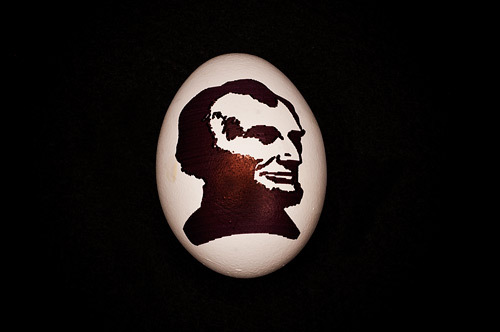 So you’ve got an Egg-Bot… Congratulations! You may want to share with others what this amazing machine can do. 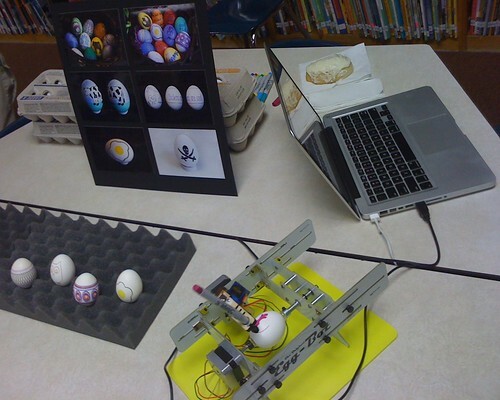 Here’s what I’ve learned since I built my Egg-Bot and demoed it at a number of events. This is the most basic list of things you need to get the Egg Bot drawing on eggs. I’ll also offer up a few items I’ve found useful later in this post. 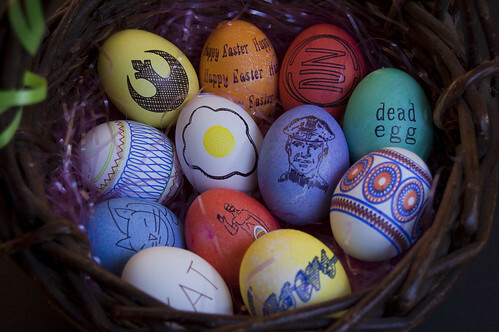 And of course you don’t have to draw on eggs, but I tend to prefer them for a number of reasons. Plus, it is called the Egg-Bot. 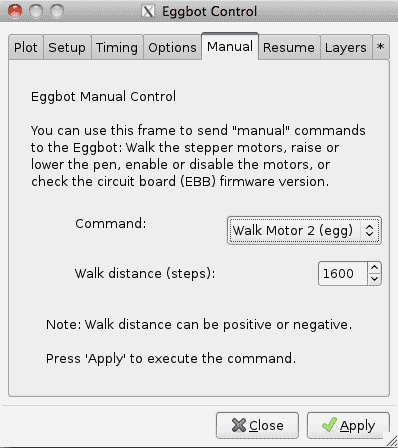 We’ll assume you’ve already got the Egg-Bot up and running, connected to a computer with a USB cable, and Inkscape and the Egg-Bot extension is installed and working. If that’s not the case, visit the Egg-Bot wiki and get it all working. We’re mainly going to cover an actual demo. 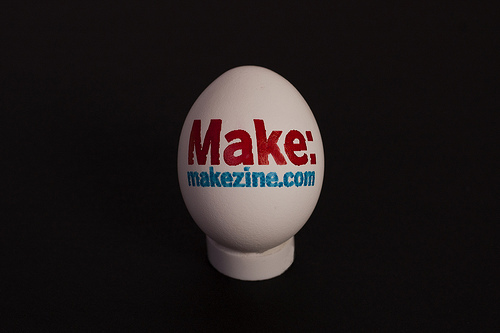 So… You’ve got a working Egg-Bot. Where do we begin? You’re gonna need some eggs. I tend to buy white eggs at the nearest grocery store. The cheaper the better. If it’s an all day affair, I may buy 48 or more eggs, and if it’s a smaller affair, a dozen or two will suffice. 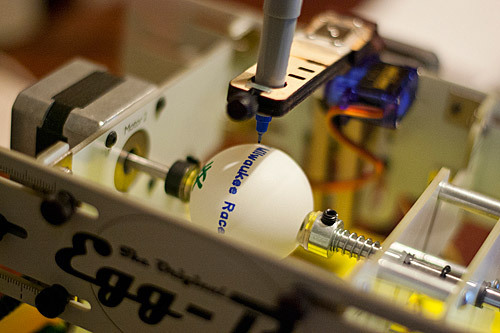 The first time I demo’d the Egg-Bot I ran to the store, bought 54 eggs and headed to Milwaukee Makerspace to get set up. I ended up printing almost every egg, and I gave a lot of them away. To kids. I kept telling kids to not drop them, put them in their pockets, or leave them in their parent’s cars. Raw eggs seem to work fine in the Egg-Bot, but you have to be ready for when they break. Breaking while in the machine can be messy. Egg on your plunger is no fun. Pro-tip: Bring some napkins or paper towel! 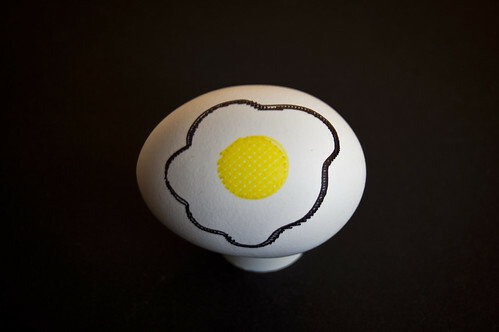 Great for cleaning up broken eggs, and useful to get the ink flowing from a Sharpie. The good thing about raw eggs is, if you get one that turns out totally awesome, you can try to hollow it out and save it, which is something you can’t do with a hard-boiled egg. If you’ve decided to use hard-boiled eggs, you need to allow time to boil them, but even if you are using raw eggs, you’ll want to start early. Like, a day or two early. I like to show up to a demo with a bunch of eggs already printed. 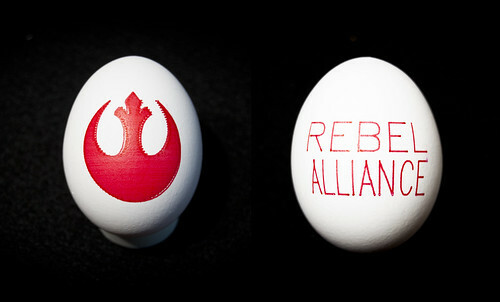 So at least a day before the event, spend some time printing some awesome eggs. Now’s the time to try those designs that may take a long time to print. Also, experiment! 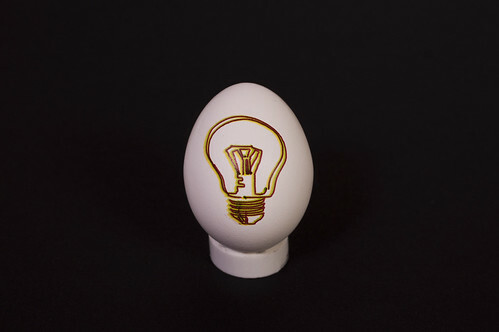 The eggs you print before the demo will be put on display while you print other eggs. Pro-tip: If you’ve got an iPad or some sort of digital picture frame device, set it up to do a slide show of your best eggs. I’ve also showed some of my eggs with a simple display board and a bunch of photos attached. This is the kid-friendly way to do it. It seems to happen every time… someone wants an egg. What to do? Give them an egg! usually during an event I end up printing more than one of a specific design, so once I have two or more, I don’t mind giving one away. Half the fun of the Egg-Bot is seeing it in action, and the other half is seeing the final product. If you give away too many at first, you’ve got nothing to show, so balance it appropriately. Pro-tip: Keep a bunch of plastic baggies on-hand for people to put eggs in, especially if they are raw! Sure, you can just use egg cartons to hold your eggs, but I like a nice piece of “egg crate” foam which is practically made for holding eggs! It’s easier to pick up and set down the eggs as compared to an egg carton, and it looks much better. As a bonus, it actually goes in the box that holds the Egg-Bot, so it serves a dual-purpose. Sure you can use a basket, but this tends to put egg against egg, which could lead to cracking. I usually let people know what I like about the Egg-Bot. I tell them what it does, and mention that it’s a kit (they often ask if I “invented” it) and they can buy they kit, or download the instructions and build one themselves. 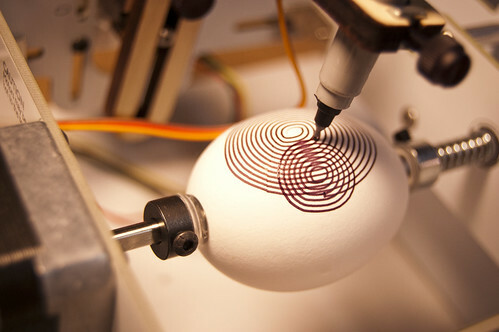 I usually say “The Egg-Bot is an open source art robot” or something along those lines. I tell people that you can do Christmas ornaments, ping-pong balls, and other “roundish” objects with it, and that there is even an engraving attachment. If you’re excited about it, people tend to take interest it in. Most people walk away smiling and talking about how cool it is. Did I forget anything? Probably. Oh yeah, bring a power strip and an extension cord! You never know where you might be in relation to an outlet, but those two things always come in handy. Don’t do any crazy software updates just before a demo. Test everything the day before to make sure it works, then leave it as-is. 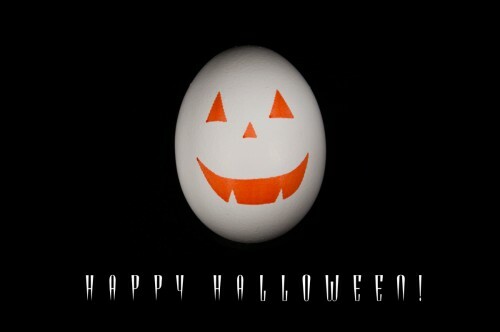 OK, that’s all I can think of… Egg-Bot on my friends, Egg-Bot on! 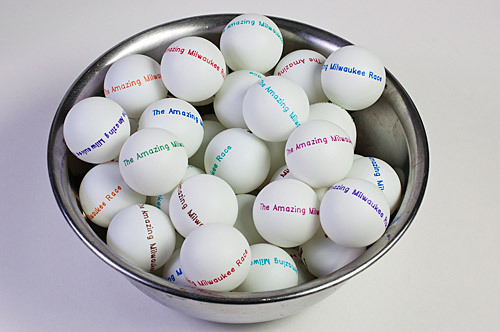 Here’s the end result, a whole bunch of The Amazing Milwaukee Race ping-pong balls. We originally tried to use the official logo, but at such a small size it just wasn’t as legible as we wanted, so I decided to go simple and just use text, but mix it up with all the different Ultra Fine Point Sharpies that I had available. I’ve almost always plotted on eggs, so doing ping-pong balls was new to me. I found the trick to doing them well (besides raising the height of the motor that holds the pen arm) was to put the ball in with the printed logo aligned directly upwards, and then using the manual control to spin the ball 180 degrees (1600 steps) so the logo is facing downwards so you can center your plot onto the backside where you’ll have the most room and (in theory) the artwork should be centered. Once you’ve done this, just plot as normal! The other nice thing about using ping-pong balls rather than eggs is that ping-pong balls are all the same size (in theory) while eggs are all slightly different. Oh, ping-pong balls are also lighter, which means there should be less slippage, which sometimes occurs with eggs due to their weight. DamCamp is coming up on Saturday, March 24th, 2012 in Beaver Dam, Wisconsin… and I’ll be there talking about Art Robots, machines that draw, and other various nerdy things. So besides the Egg-Bot, I’ll also have the Friday Night Drawbot there, and talk about a number of other art robots I’ve seen, and would like to someday build. There’s been so much intersection between art and technology lately (at least in the groups I’m involved with) that I’m really hoping for a lively discussion. Of course we’ll also have a fun demo too. 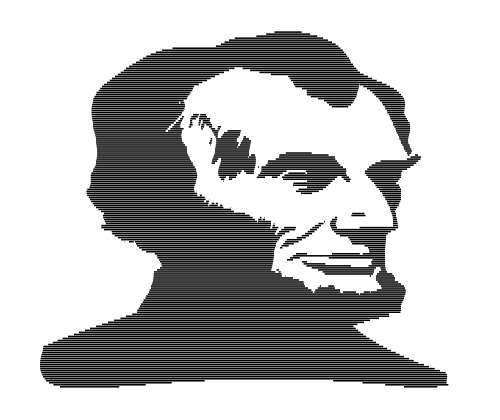 I’ve actually started trying something new, and instead of doing an outline and then filling it with lines, I just delete the outline and print the lines. This seems to work better for some pieces due to how things align. I’m sure I’ll be doing more testing between now and Easter.